Rock n’ Skoog Band. Using Skoog and Rock Band controllers to make music accessible. This post is from Billy and Andy at “Billy and Andy’s Manchester Music School’ http://www.billyandandy.co.uk they have been using Skoog for a while now and we asked them to give us the low down on their favourite Skoog times. It’s a Rock n Skoog band, take it away Billy and Andy! Has anybody else noticed that the Skoog 2.0 bears a resemblance to the drum kit from Rock Band? Those red, orange, yellow, green and blue rings against the charcoal grey background…no? This is probably because while I was wasting hours and hours of my early twenties playing video games, you were doing something productive. Well done you! Anyway, I thought I would write a post about how we use these old games controllers as cheap and cheerful accessible instruments to expand our Skooging experience! 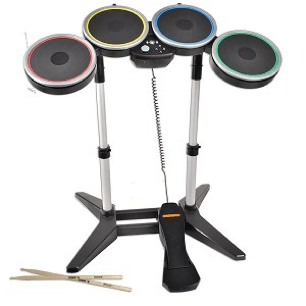 For those who aren’t familiar, Rock Band and its very similar rival, Guitar Hero, are rhythm games available for various consoles that make use of plastic, instrument-shaped games controllers. In a similar way to Skoog’s “Skores” feature, players hit the button or pad that corresponds to the colours shown on screen, although unlike the Skoog, the instruments don’t actually make a sound, not really, they just allow you to get in-game points for timing and accuracy as you button bash along to your favourite tracks. However, thanks to a fantastic app called ControllerMate, these can be converted to fully functioning MIDI instruments. I won’t attempt a full ‘how-to’ because for most it would probably get boring pretty quick, but there is documentation out there and at it’s most basic, setup is pretty straightforward. Unfortunately, the app is Mac only, but for the PC users, particularly the technically minded I’m sure there are many other ways to skin this particular cat (Max/MSP & Max4Live spring to mind.) For anyone who is interested and feels they need a few pointers, just drop us an email info@billyandandy.co.uk and we would be more than happy to help. The fact that Skoog and Rock Band instruments share a colour scheme is super useful! When working with small groups of young people with learning disabilities, we make use of Skores and even the Rock Band game itself, to get them used to working with notation. As many of the young people with whom we work are keen gamers, in many cases they have built up a skillset through gaming that can be applied to music, and just need to make that link. It’s also great for learning tunes! We recently taught a group consisting of Skoogists and Rock Band guitarists/drummers to play The White Stripes’ Seven Nation Army, each with their part scored out with coloured sticky dots. Both the Skoog and the Rock Band instruments lend themselves well to working within the pentatonic scale. As part of a Chinese New Year celebration at a school for children with autism, we set up two Skoogs, a Rock Band guitar and a drum kit, to sound like a Di Zi Flute, a Guzheng, an Erhu, and various Chinese percussion respectively. Working within that restricted set of notes and with those sounds, the kids were able to improvise and have a great time playing as a group, while making some genuinely beautiful sounding music! Rock Band instruments actually make awesome accessible instruments in their own right, especially for the price. They don’t have the tactile joy of the squeezy Skoog, or its expressivity (no velocity sensitivity for example) but with a bit of imagination they can be made to do some pretty cool stuff! The guitar’s whammy bar works great for pitch bends, vibrato, or just general noisy madness! The original Rock Band games are kind of yesterday’s news in the gaming world, so the controllers can be picked up in charity shops or on eBay for next to nothing! A few years ago, one accessible musical instrument could easily have set us back a few thousand pounds – money that, we as a very small organization, just don’t have. Its probably not too much of a stretch to say that we wouldn’t be doing what we’re doing were that still the case. Thanks to the clever people out there creating fantastic tools like the Skoog and ControllerMate, we are able to kit a band of young, disabled musicians for about what I paid for my first electric guitar which we think is pretty amazing!